Our new School of Management building receives planning consent. Plans for our new School of Management building have just received planning permission. The University is investing £70 million in academic infrastructure to realise its aim to be an international leader in graduate education and a top 50 global business school. The project will create over 100 permanent new jobs and is anticipated to increase income to the University by more than £450 million over 25 years. 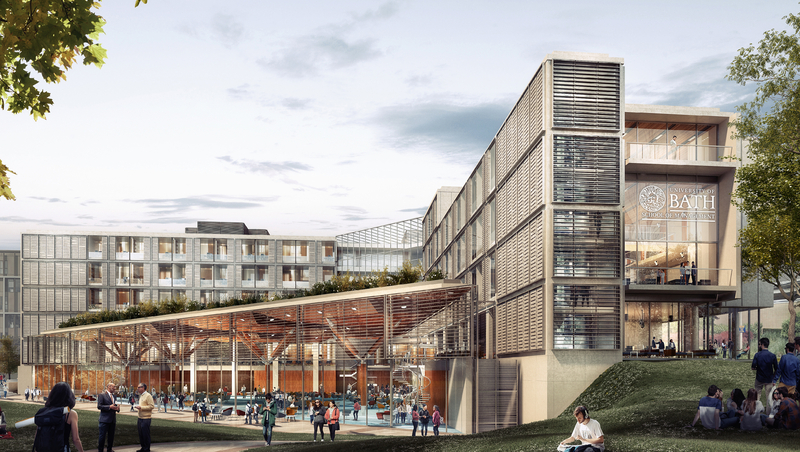 The building will feature an open layout to enable joint working to flourish, supporting the School’s core philosophies of ‘engagement, education and collaboration’ and inspiring partnerships between students, academics across the University, and corporate partners. The intention is to foster entrepreneurial thinking that develops a vibrant ecosystem of inspiration, initiation and acceleration to establish the School of Management as an anchor point in the local and regional business community. The University is working with pioneering British architects Hopkins, responsible for award winning buildings including the London 2012 Velodrome and Wellcome Trust’s Gibbs Building as well as high-quality educational buildings at universities including Cambridge, Princeton and Harvard. The new building will pave the way for an increase in postgraduate students in the School, largely through the creation of new courses, strengthening the University’s research portfolio and supporting its ambition to become an international leader in graduate education. Polden, our new postgraduate accommodation is currently being built on campus and will open this autumn. Professor Veronica Hope Hailey, Dean of the School of Management and Vice-President (Corporate Engagement) of the University of Bath, said: “This new building will harness our energy and conviction for world class research and teaching, driving creativity, ambition and innovation. The investment will ensure that the School and University can compete and thrive globally, particularly as Brexit unfolds. “We are delighted to have retained Hopkins Architects and are confident that they will create an inspiring space where staff, students, employers, researchers and returning alumni all choose to spend time with one another.